We celebrated our 70th anniversary in 2016, making Clayton & Brewill one of the most long-established independent accountancy firms in Nottingham. During 2016 we raised funds for the Lincolnshire & Nottinghamshire Air Ambulance. In June 2016 Clayton & Brewill was 70 years old. 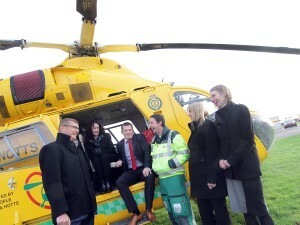 To mark our anniversary as one of the East Midlands’ longest-established firms of chartered accountants we raised £ 5,000 for The Nottinghamshire & Lincolnshire Air Ambulance. The Air Ambulance can get a patient to hospital in the fraction of time taken by a road ambulance, playing a vital role in the emergency services available in rural and less accessible areas, yet it is entirely reliant on public donations. Starting with a charity abseil on 21 April, our team took part in a range of sporting and other endeavours during the year to play a small part in helping the Air Ambulance team raise the £2.2 million it needs every year to keep flying. Ten Clayton & Brewill people, together with some of our clients, launched themselves off The Roaches in Derbyshire to kickstart the fundraising efforts. Just a few days after the abseil, trainee accountant Hayley Purdy ran the Virgin London Marathon – well done Hayley! As part of our fundraising efforts, we also held a drinks event and a golf day. Clayton & Brewill is a firm of chartered accountants in Nottingham, Long Eaton and Melton Mowbray. We work with individuals, private businesses, farmers and GPs to prepare accounts and provide tax advice in a friendly, affordable, effective fashion.